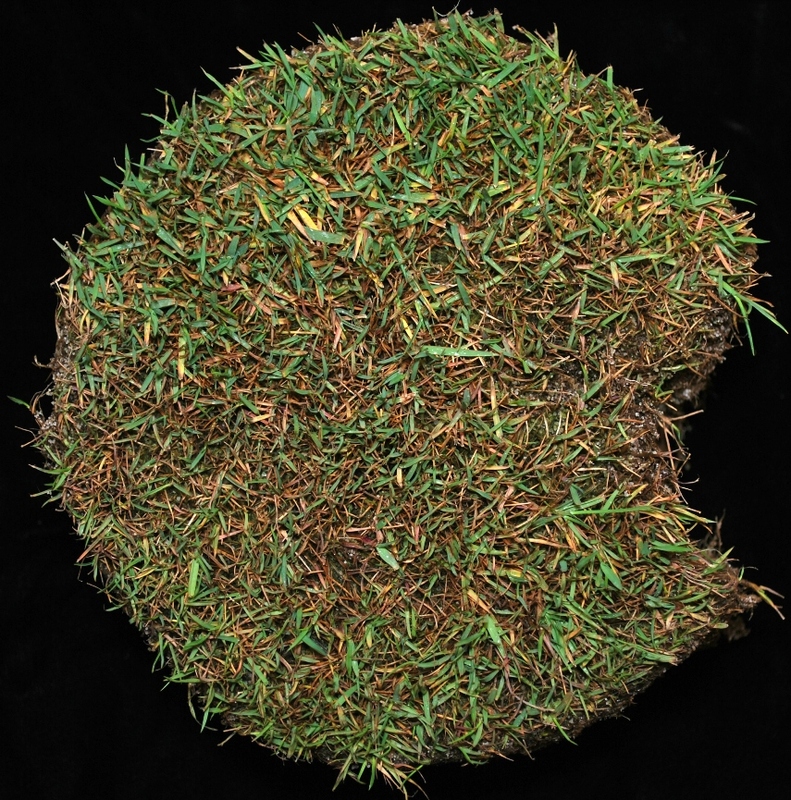 A sample diagnosed with take-all patch of creeping bentgrass was the highlight of the turfgrass submissions to the Plant Diagnostic Laboratory this week. 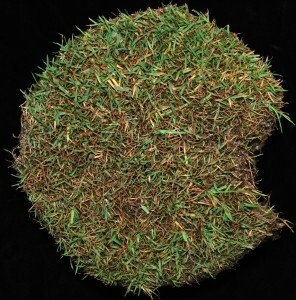 This sample marks the first in the seasonal transition on golf courses from diseases common to late-winter and early-spring (snow molds/yellow patch) to the late-spring and early-summer problems (take-all/brown ring patch). Yes, it was an exciting day for the turfgrass pathologist! 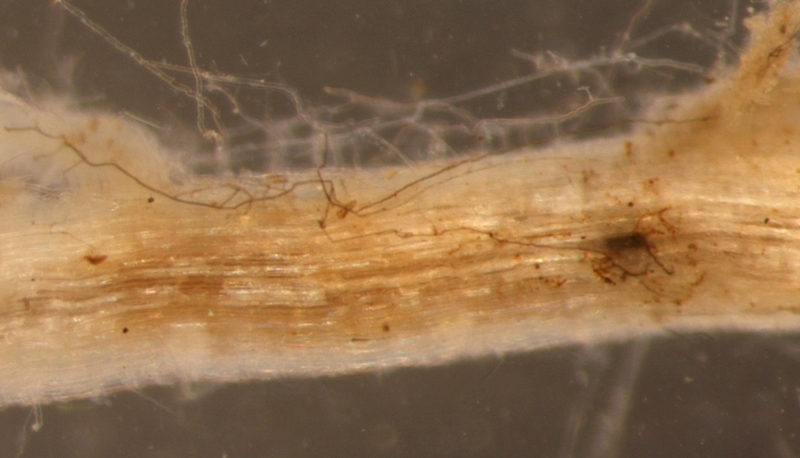 The fungus that causes take-all, Gaeumannomyces graminis, does most of it’s damage to bentgrass roots when soil temperatures are between 40°F and 60°F. Above ground symptoms subsequently appear on infected grasses in late-spring as higher temperatures and increasing transpiration demands begin to stress plants with infected and dysfunctional root systems. Our sample came from a golf course in Bristol, Virginia, which is obviously a bit farther south than us and slightly ahead in the season. Take-all samples from the Northeast region generally start to roll into the laboratory just after Memorial Day, so this sample is a leading indicator for what we can expect in our region over the next few weeks. The superintendent who sent the sample described his problem on the submission form as “distinct patches and rings of bronzing bentgrass in the fairways and approaches that occur in roughly the same locations from year to year.” As per routine laboratory protocol, discolored plants were extracted from the plug and evaluated for root health. 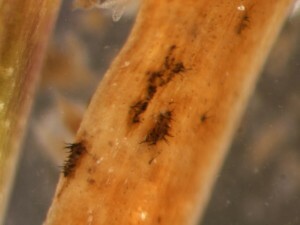 Rotted roots infected with darkly pigmented, ectotrophic hyphae were observed. Nice field symptoms, rotted rots with ectotrophic hyphae, clear infection courts, and perfect seasonal timing = classic take-all! Of course, almost every sample that we see diagnosed with a root-infecting patch disease – take-all or summer patch – also has a little anthracnose to contend with. Our sample did not disappoint. Click here for a presentation on the management and control of take-all patch.